One in five American children has trouble reading. But they are not stupid or lazy. 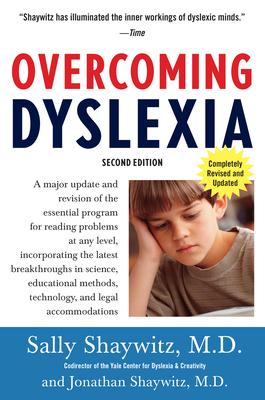 In Overcoming Dyslexia, Dr. Sally Shaywitz, codirector of the Yale Center for the Study of Learning and Attention and a leader in the new research into how the brain works, offers the latest information about reading problems and proven, practical techniques that, along with hard work and the right help, can enable anyone to overcome them. Here are the tools that parents and teachers need to help the dyslexic child, age by age, grade by grade, step by step. Sally Shaywitz, MD, is Professor of Pediatrics at the Yale University School of Medicine and codirector of the Yale Center for the Study of Learning and Attention. A member of the National Reading Panel and the Institute of Medicine of the Academy of Sciences, and chosen as one of America’s Top Doctors by Castle Connolly, she lectures regularly throughout the country and has appeared on CNN, Good Morning America and The Today Show.